Targwa Monastic School is BSB’s 15th school. Located in Shan Kwin, an ethnic Bamar (Burmese) village, it lies about three hours' drive west of Pyay over rough roads. Construction was completed and the school opened with a big celebration in July 2016. 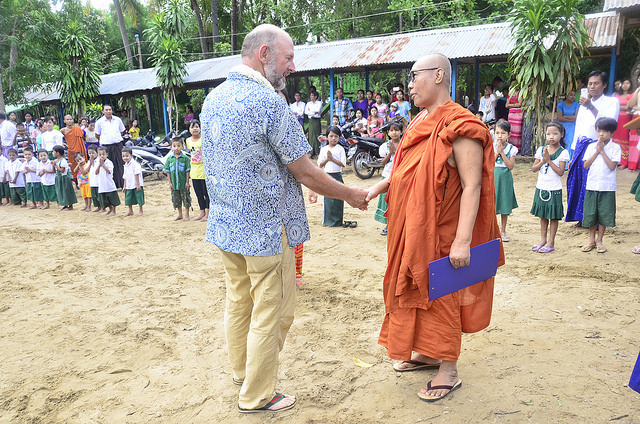 BSB Founder Bob Cornwell was lucky enough to be in Burma and participate in the celebration. Classes at the former school were held outside under the trees, in a falling-down building or in a borrowed monastery dining hall. More than 150 K-8 students will benefit from the new school. BSB’s Myanmar partner for Targwa is Paung Da Oo Monastic Education School in Mandalay, which has 6500 students in preschool through college. Curriculum and administration are directed by U Nayaka, Founder and Principal of Paung Da Oo. He and Paung Da Oo are widely regarded as exemplars of monastic education. Public education is generally provided through both government and monastic schools in Myanmar, with about a quarter of children educated in monastic schools. Unlike government schools, monastic schools charge no fees and therefore educate the poorest children. U Nayaka is a native of Shan Kwin village. Classes for this large monastic school were held outdoors or in monastery buildings until BSB worked with Phaung Daw Oo Monastic School to build a large kindergarten through 8th grade classroom building. 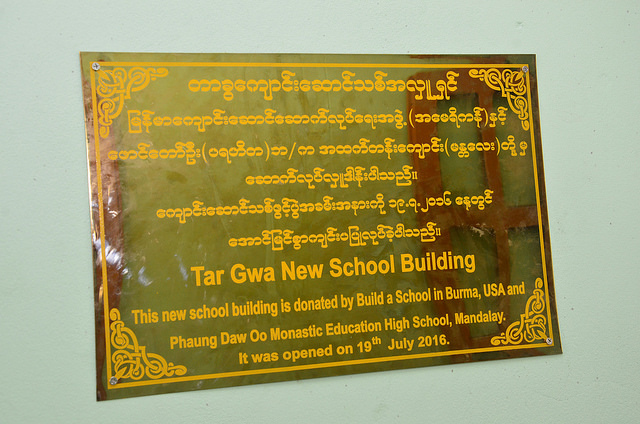 Tar Gwa Classes for this large monastic school were held outdoors or in monastery buildings until BSB worked with Phaung Daw Oo Monastic School to build a large kindergarten through 8th grade classroom building.